There’s going to be a photographer at Beautiful + Damned tonight, taking pictures for official B&D flyers, a dedicated MySpace page and the like. Please come; and if you’re coming, please dress up. 8pm start, Metropolis on the screen, a bit of live performance, anything goes. And indeed, ‘Anything Goes’ from The Boys In The Band. Tonight, I intend to play Paul Williams’s ‘The Rainbow Connection’ from The Muppet Movie, and either ‘Let’s Go Fly A Kite’ or ‘Feed The Birds’, or both, from Mary Poppins. I’ve also discovered a rather good version of ‘Cabaret’ by Louis Armstrong, which Russell “Not With A T’ Davies alerted me to on his excellent Radio 2 programme. Trivia learned from the same radio show: Mr Sinatra’s song ‘New York New York’ – the one with the opening line “Start spreadin’ the news” – owes its creation to Robert De Niro, the star of the 70s Scorsese film for which it was written. The songwriters Kander and Ebb (of Cabaret and Chicago fame) originally wrote a completely different theme song, but Mr De Niro dismissed it as ‘too weak’. So they went away and produced the all too familiar one we know today, particularly popular after a few drinks. Writing this from the El Minzah Hotel’s 1930s Moorish Wifi. Fezzes everywhere. And yes, I did have to look up the plural of ‘fez’. Mr MacGowan is still here. The El Minzah is very Moorish. I bet I’m not the first to make that joke, but I don’t care, frankly. Venue: The Boogaloo, 312 Archway Road, London N6 5AT, UK. 020 8340 2928. Price: Free entry, but patrons are strongly encouraged to dress Timelessly Stylish. Another appeal to make, this time to my Swedish readers and those connected with the Swedish indie music scene. The dazzling baroque-pop band Scarlet’s Well, who are fronted by Bid of The Monochrome Set, and with whom I’m an occasional lyricist and ardent fan, are keen to play in Sweden. They want to know if I have any contacts with promoters over there. Well, what happened with Fosca last time was a group of Fosca fans actually became temporary promoters themselves, purely to put us on. I don’t think I really know any proper professional Swedish promoters. But if any are reading, do please contact Bid and Scarlet’s Well via their webpage. That’s enough appeals for friends for now. I’ve got a backlog of requests, in fact, from all kinds of people asking me to publicise their projects or help them find collaborators, but this is meant to be a diary, so I must keep such announcements sporadic if I do them at all. Donny asks: Please could you draw a picture of Dickon Edwards? 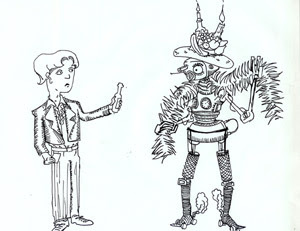 Anna asks: Please would you draw a robot wearing a feather boa and a hat with wax fruit on it? Decided to combine the modern day dandy that drinks in the local and the robot dolled up for a nice cabaret show. Don’t they look cute together. Actually, I think he’s drawn me as the fifth Doctor Who wielding a Sonic Screwdriver and a piece of Psychic Paper. Here’s this month’s B&D details. If you’re in London that day, come, be nice, enjoy feeling lightly attractive and not saturated in London sarcasm. More information on the News page. I’m keen to make a new paper flyer for the Beautiful & Damned Christmas Masked Ball. Something simple in B&W A6 size, where four flyers can be printed out on a sheet of A4 and cut up accordingly. My own talents in this department are found wanting. So if this sort of thing is second nature to you, please do get in touch. I’ll pay what I can. BEAUTIFUL & DAMNED – Christmas Masked Ball. The Boogaloo, 312 Archway Rd, N6 5AT. 020 8340 2928. Free. Dress code: Stylish & Masked. Some sort of 1920s-themed masked ball imagery would be ideal. I’ve been charged with taking dictation from Mr MacGowan again. This time, it’s for the Guardian website’s blogs section. Essentially, I get him on the phone while he’s on tour, he rants on about whatever’s on his mind, and I write it all up. Rather helps that my answering machine can be switched to recording a live call. The blog has the blessing of Mr O’Boyle and Ms Clarke. He mentions a Mr O’Neill, who has something to do with football, specifically Celtic FC. It’s fair to say I had to look him up. My fellow DJ Miss Red had now re-branded this month’s Beautiful & Damned as a Christmas Masked Ball. As ever, the dressing-up is optional, but the addition of a suitably stylish mask is strongly encouraged. Even those cheap Zorro-style eye masks will do. Other details are unchanged; the club is on Thursday 21st December, at The Boogaloo. Full club information is on the News page.